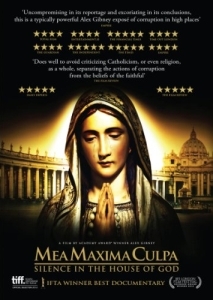 Released into UK cinemas earlier this year around the announcement of former Pope Benedict’s XVI resignation, Alex Gibney’s hard-hitting Mea Maxima Culpa: Silence in the House of God (2012) couldn’t have been more timely. An exactingly well-researched documentary, Gibney strikes the fine balance of creating a story that kindles an incredible amount of rage at the events at hand, matched by the bigger picture of the inherent corruption in the Catholic church. Opening in a US school for the deaf in the late 1950s, we encounter Father Lawrence Murphy – a man who, from photos and archive footage – appears to be a caring priest. However, cameras don’t always capture the truth. Throughout this heart-wrenching account, we’re provided with tear-stained, powerful interviews from the paedophilic priest’s now-middle-aged victims, voiced by notable actors including Ethan Hawke, Chris Cooper and John Slattery. Described as a “ravenous wolf”, Murphy would stalk the dorm rooms of his flock back in the 1950s and 60s, selecting his victims. There are, however, also fleeting moments where Gibney falls into near-sensationalist territory using unnecessary red washes on the footage containing Murphy’s sexual predator. Returning once again to the faux-celibate priest, we’re shown how he was clinically careful to choose children whose parents didn’t know sign language, so that they would be helpless to inform them of the abhorrent acts taking place. When they finally manage to inform another priest, Father Walsh, their cries go unanswered, swept under the House of God’s carpet by the higher echelons of the church, often offering pay-offs to the victim’s parents in exchange for their silence – with the Vatican seemingly complicit throughout. From these heartbreaking contemporary accounts, Gibney moves on to widen the scope of Mea Maxima Culpa, tracing all the way back to the (apparently) not-so-Holy See of Rome. The unfeeling actions of the Catholic church are explored through the political machinations and inherent corrupt of the catholic ecclesiastical system, where even when the Congregation for the Doctrine of the Faith (CDF), an institution that one watched over the infamous Inquisition, headed up by Benedict XVI, buries the case. We see a tirade of priests, cardinals and bishops behaving more like mob bosses than men of the cloth, all of whom prefer compliance with the likes of Mussolini’s fascist state than solving the inbuilt problems of a corrupt institution. With Mea Maxima Culpa, Gibney has lifted a veil onto a presumed world of abuse and immorality.